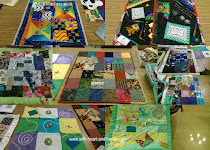 The amazingly talented Jean Wells - Quilt Artist, Author, and Instructor came as our Mid-Valley Quilt Guild's guest speaker and she brought with her such an unbelievable assortment of quilts, both finished and in progress ,that it was almost overwhelming that one woman can be, and do all that! For any of you not familiar with Jean, she began quilting about 41 years ago and opened the now famous quilt shop "Stitchin' Post" in Sisters, Oregon...which is a kind of charming Western themed town that holds the world famous "Sisters Outdoor Quilt Show" the second Saturday in July. The year she opened her store was the first year of the quilt show......she's obviously an achiever and not afraid to try new things! That year they showed 17 quilts...now they show over a thousand and it is considered a quilter's dream vacation to attend the show. 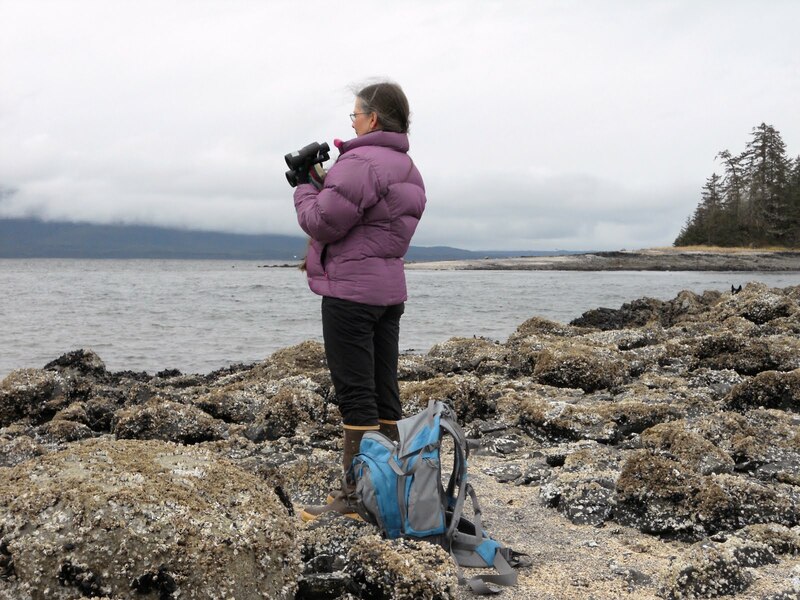 Jean does the most intricately pieced modern interpretations of quilts straight out of nature and the love she has for the beautiful area she lives and works in, both as a quilt artist and as a designer. The also famous Karla Alexander (who is a member of our guild) greeting Jean and holding up some of her quilts until others came in and helped as well...it's always a treat when Karla is able to come to our meetings but it was truly special seeing the bond Oregon quilters/authors have with each other. The other volunteers took turns displaying them on stage and then parading them around our group of 150 morning quilters so we could see them up close and personal...and Jean told us 'feel free to touch them!" We are such a big group, we have an evening session as well. All together we have way over 350, may be more... quilters in our guild. For more background information on the Sisters Quilt Show that Jean began all those years ago, I'll include links to all of my previous posts on the show and on the quilting dignitaries such as Gwen Marston and Freddy Moran, and the ladies of Gee's Bend among dozens of others that not only teach classes, but display their newest quilts every year. Oh, thank you for sharing all these wonderful pictures. I love her book. I bet it was wonderful to have seen those quilts. That's so neat. I am reading her book. I would have loved to have been there for that! Wow, awesome!! I have always been a huge fan of Jean Wells (and also Karla Alexander). Valori Wells is certainly taking after her mother. What a terrific quilt show. Oh, what a treat that must have been! I've admired Jean's work since the very beginning - I have many of her books. Would have loved to have been there with you! Glad to see Jean is still making beautiful quilts ! Saw her at our guild at least 15 yrs ago, her style has certainly changed from very traditional/reprod quilts to very modern ... her daughter Valori is very talented too. Hope to get to Oregon to see the Sisters show someday soon! Wow what a show it must have been- I recently bought one of Jean's newer books- it is about Intuitive Color and she shows some of the techniques she has done in the quilts that you have got to touch and see up close and personal. It strikes me that she loves quilting and would be just so personable to meet. I am drooling with envy that you have met her and Karla never mind the other famous ladies at Sisters. It would be hard to pick the one I would love to meet the most though Freddy Moran would be right up there. Meeting these lovely women would be fuel to feed your creative spirit. Thanks for sharing your guild show. 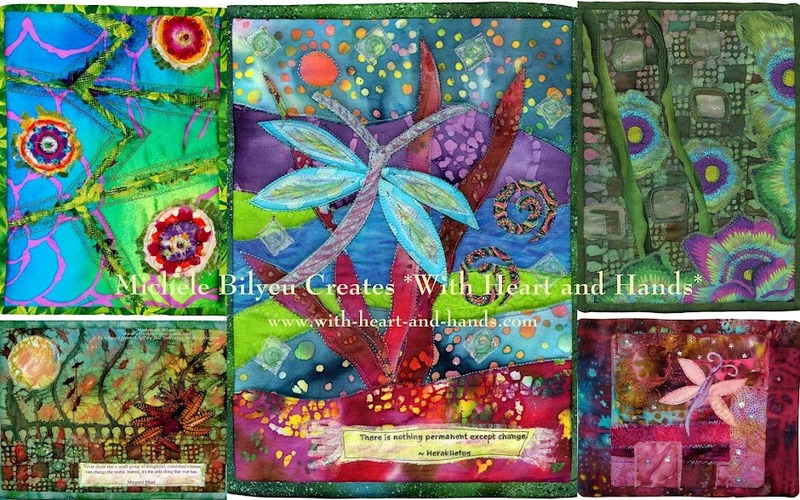 Thanks for sharing these beautiful, colorful, organic quilts!